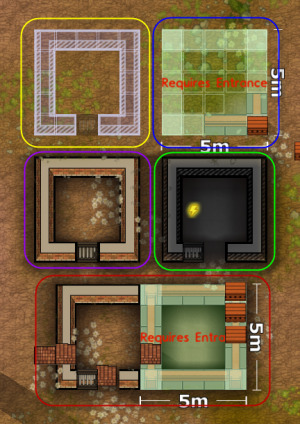 The content of this page is based on Prison Architect Version 1.2. A foundation is the underlying structure, initial floor, and brick walls of any building. Creating foundations is the first part in the process of constructing a new building. Foundations create "indoor zones" which are necessary for some types of rooms. Some rooms don't need to be inside like the Deliveries zone, Storage, Garbage, Yard, Shower, and Workshop. This tool allows you to build the only form of foundation currently in the game. Building Foundations allows the placement of certain Materials and Rooms. Click once to set first corner, click again at opposite corner for rectangular placement. Minimum units (squares) for width and length is two. To cancel the building you can right-click on the outline. Four walls are not a foundation, but a foundation does contain four walls. It's the same thing as, four walls are not a house but a house does have four walls. The Yellow box has four walls and a Jail Door, and will not have a floor or a roof. Once built, it will look like the Purple box. 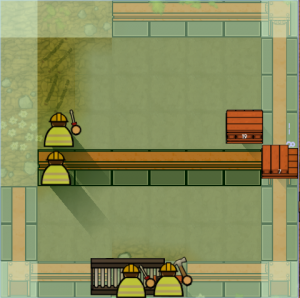 You cannot make any indoor rooms here, for example Cells. The Blue box is a foundation without a jail door. If I put in a jail door on the bottom, the workers would turn it into the Green box. Later in this page you will learn that foundations can overlap and can expand the original foundation. If you look at the Red box in the picture, you will see that the foundation overlaps with the four walls and the jail door. 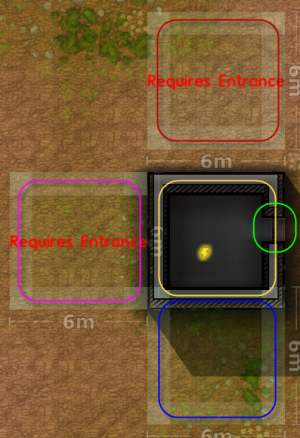 However, as explained in this image with Yellow, four walls and a door are not a building. Because of this, the foundation cannot use the door that is in the walls, and thus the foundation cannot be completed. For all three foundations there is a jail door placed in the purple square. What is happening here? For the Red foundation, the door is not in the wall. If this foundation would complete, you would have four walls with a door on the floor. Think of it as you sitting in a big box and holding a door in your hands. For the Green foundation the door is located in the wall. This way if the foundation is complete, you can walk through the door in the wall to enter or leave the building. For the Blue foundation the door is on the outside of the building. This would mean you are in a huge box, and have no door at wall. Red cannot be completed because it has no jail door. Because it is a new foundation, not attached to any other foundation, it cannot share a door. Pink cannot be completed because it has no jail door. The way this foundation is placed (next to Yellow), it will use the wall of Yellow as a shared wall. Pink then has 4 walls, but no doors. Blue is the interesting one: It is placed ON an existing foundation, Yellow. This means it will break down the wall of Yellow and expand the area where Yellow is. Blue then only has 3 walls and can share the Green door of Yellow. 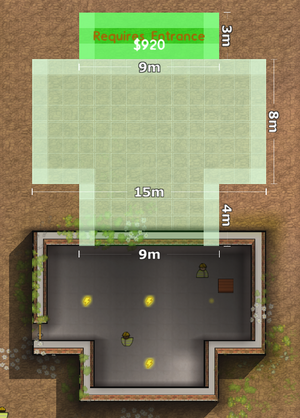 You can extend foundations both before and after actually building it, as the bottom image shows. This allows both planning non-rectangular buildings and enlarging existing buildings. Cost depends purely on x(width)*y(height), with Cost = x*y*10. Brick Walls or Concrete Walls, depending on what is selected, will be placed along the edges, except on sides where another foundation already exists. An entrance door must exist (or be placed) on the perimeter for the foundation to "complete." Steel is needed to build foundations, plus concrete for the Concrete Floor installed in all buildings by default. Designates coordinates of previously placed Building Foundations for demolition, a task accomplished by Workmen. If you simply wish to remove a wall but keep it as part of an indoor space, use the "Demolish Walls" or "Clear Indoor Area" tools from Materials menu. If you place a foundation alongside an existing building, it will share that building's wall automatically upon completion of your zone definition. The dimensions shown on a new foundation can be deceiving. For example, if you want to create a 4x4 room (for, say, an Office) then the foundations must be laid out as 6x6. This accounts for the four walls at the edges taking up floor space. This page was last edited on 18 November 2016, at 10:04.